Listed below are homes for sale in Waunona, a neighborhood located in South Madison, WI. Listings are updated multiple times a day from the SCWMLS. For more information about any of these Waunona homes for sale, just click the "Request More Information" button when viewing the details of a property. We can provide you with disclosures, past sales history, dates and prices of homes recently sold nearby in Madison, and more. And, for your convenience, register for a free account to automatically receive email alerts whenever new Waunona listings come on the market that match your search criteria. Lake Monona shoreline to the north; West Broadway Avenue to the south; Paunack Park to the east; Nob Hill Road to the west. Many of the popular photos of the Downtown Madison skyline reflecting off Lake Monona were taken from the Waunona neighborhood. 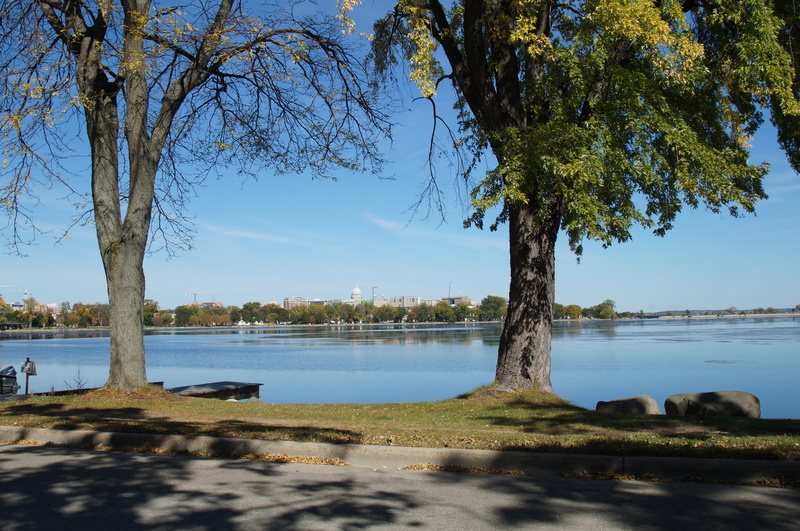 Tucked along the south shores of Lake Monona, Waunona offers photo-quality vistas of Madison’s famed downtown isthmus. However, neighbors don’t merely enjoy Lake Monona’s spectacular view from the shorelines. Parks, trails and abundant shoreline access in the community provide plenty of opportunities to spend a day on the lake, or to explore the city’s extensive trail system and downtown area. Esther Beach, located north of Waunona Way, is a perfect sandy bottom beach for swimmers. It’s also a great place to store and launch canoes and kayaks, or to cast a fishing line. Paunack Park and Marsh, meanwhile, affords additional shoreline access on Waunona’s far eastern border. Additional opportunities for canoeing, kayaking and fishing are available there. Waunona Park lies at the heart of the community and offers basketball courts, tennis courts, playground equipment, a shelter and five acres of green space. Another seven acres of green space is available at Thut Park, located off Nana Lane. Many young families are drawn to Waunona by its quiet residential streets, abundance of parkland and close proximity to schools and businesses in the area. Aside from two isolated pockets of commercial space along West Broadway Avenue, Waunona is comprised exclusively of residential development. Mid-century development brought many of the single-family homes to the community. Newer development has also brought a number of townhouses and condominiums, which makes Waunona an incredibly versatile neighborhood. Despite Waunona’s sleepy lakefront appeal, its central location puts it within minutes of Downtown Madison, Monona and Madison’s west side. Downtown Madison is about four miles north of Waunona by car, but the bike path that extends west from the neighborhood along John Nolen Drive makes for an easy commute by bike or foot, too. Olin-Turville Park, also located just west of Waunona, has a public boat launch, beach and about 50 acres of green space. Waunona’s close proximity to the West Beltline Highway makes for east travel to Madison’s west side, too. West Towne Mall, and the popular Gammon Road and Mineral Point Road commercial corridors, are about eight miles west of Waunona. Surrounding communities are also nearby. Monona is less than two miles east of Waunona, Verona is about 10 miles south and Middleton is about 11 miles west. Picturesque views, lakeshore access and central location make Waunona a truly unique Madison neighborhood. For information about finding a home in the Waunona neighborhood or to sell your Waunona home, contact our team for a better real estate experience. The Waunona neighborhood is located on the South Side of Madison in MLS area Madison – E15. Below are more homes for sale in that area.